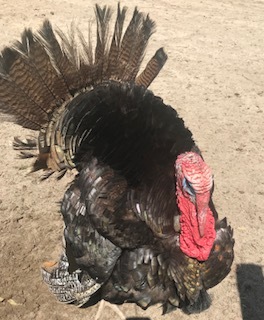 During a recent Reiki class at Cotton Branch Animal Sanctuary, I took a few minutes to share Reiki with the turkeys while students were practicing. I knew from previous visits the turkeys were very receptive to Reiki. I sat on a low fence rail just inside the turkey enclosure. As I began my practice, the turkeys came over and started milling around. One inched closer and closer, turning slow circles in front of me. He would stop every so often and inch closer, until he was pressed against my legs. He stayed a bit, then moved off. He came back and faced me. He began the slow turn again, stopping with his side to me several times. I remained quiet and he moved closer, placing his head between my knees. He rested there for a while before backing up and looking at me. He stayed facing me and moved closer. I offered my hands and he moved into them. I placed my hands on his head and neck and he stood quietly. Then, he climbed onto my feet and started trying to climb my legs. Ouch, big claws! I gently nudged him away. He nipped my hand! What the heck, Mr. Turkey? He again stood on my feet, this time without pushing or climbing, both of us enjoying Reiki and the moment. Oh, but Mr. Turkey couldn’t get enough! He tried to climb my legs again. Ouch! Ouch! I gently pushed him away and he bit me harder this time. Really, Mr. Turkey! I wasn’t sure of his intentions, but I was sure I didn’t want a full grown wild turkey in my lap. So, I quietly moved outside the enclosure. Mr. Turkey came right up to the fence and continued to soak up Reiki for as long as I remained. When the class regrouped near his enclosure, he stayed close as students shared Reiki with other animals nearby. I did not sense any aggression on Mr. Turkey’s part; I just knew a large turkey in my lap was not a good plan. Having been on the receiving end of flapping turkey wings (non-Reiki related), I didn’t want those strong wings near my face or sharp claws in my lap if he became excited or animated. 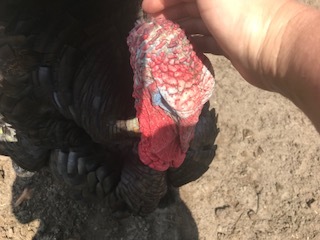 However, I was intrigued by Mr. Turkey’s behavior, as the sanctuary director said he was not tame and had not been handled. Once home, I googled turkey mating behavior and aggressive posturing. It does not appear Mr. Turkey was demonstrating any of those. So, the only conclusion is that he is one Reiki Loving Turkey! And, I have stripes on my legs to prove it. I am honored and grateful to have shared this connection with Mr. Turkey. Reiki helps us overcome fears and differences to connect in beautiful and unusual ways. I really enjoyed your story because it has been my experience too, when sharing Reiki at Catskill Animal Sanctuary where I regularly volunteer, that the turkeys were my biggest surprise as to how open and how well they respond to Reiki. Pure bliss!